I walk out to a chilly rain, which did not figure into my plans. I buy one of those obnoxious saran wrap tourist ponchos at Duane Reade, and get on a subway. I am counting on being smarter and stealthier than your average concert attendee, but by the time I make my way up to 52nd Street and then down Broadway—all the side streets were cut off—I was not entirely sure that I would be able to pull this off. Now that I think about it, there was probably a way to make it up to my friend who was just a few rows from the stage, but I found a good place in the second barrier, just behind a tall dude, but in front of an area that had to be kept clear for the camera crane. I had an unobstructed view of the stage and that was fine with me. Luckily, with advertisers and a webcast, things need to run on time, and sure enough, we are informed that we are going to start in 15 minutes, then 9 minutes. They announce the list of artists, and we cheer appropriately (or inappropriately, in the case of Chris Martin). We sit through someone from Bank of America and then Bill Clinton (who managed to drop a Hillary reference), and I’m watching the Edge’s guitar tech standing there holding a guitar that looks suspiciously like the Edge’s Explorer, not expecting Larry, Adam and Edge to walk onstage right after that. Unfortunately they are also joined by Chris Martin, who proceeds to butcher “Beautiful Day.” He is wearing a tshirt that reads “SUBSTITU2” which is actually pretty funny, but I still actively despise him. “With Or Without You” is my least favorite U2 song, and I take notes and amuse myself by texting a friend who is uptown at Bob Dylan about how painful this is. But then there is a moment where the collective noise being made by the three gentlemen in U2 not-so-gently reminds me that they are on that stage, and they are making that noise that only they can make, and I am lucky to be here listening to it. I have nothing against Carrie Underwood but did not find her songs particularly interesting. The NYU kids behind me, who were super-excited to see Kanye, kept remarking how great her voice was. But then the second-best moment of the evening took place, as Adam Clayton and Larry Mullen Jr. came out to introduce Kanye West. Larry’s voice BOOMED, “NEW YORK, GIVE IT UP FOR KANYE WEST!” with a grin so big you could have seen it all the way up to 57th Street. The crowd absolutely came alive to Kanye more than any other artist during the course of the evening. Hands in the air, dudes jumping up and down…and all of those people made their way out of the front as soon as he was done. Kanye was sharp and I enjoyed his set. Kevin Buell is checking a mic stand and so I know who is next on that stage, although I guess if I’d looked at a clock or something I would have figured that out, or even simple process of elimination. But I’m kind of glad I had that external cue, because when Edge, Larry and Adam came back out, put on instruments, and Mr David Evans began to strum the unmistakable opening notes of “Where The Streets Have No Name,” the world stood still. The opening of “Streets” is like that, you know? It’s that gentle arpeggio, that cascade of notes, that deceptively calm moment before the storm. It’s the sparks from the second you light the fuse, the opening hiss as the bubbles begin to escape from a bottle of champagne. Jump Jump Jump, I am surrounded by tourists holding up cell phones and I do not care if they think I am a madwoman, I am going to REPRESENT and they can all go to hell. This is Streets. This is what you do. It is muscle memory. It is involuntary response. It is tribal, it is ritual, it is everything. Part of the artistry of “Streets” is the way it builds from section to section, and we go from that cascade of notes into second gear where the rhythm section engages and the notes speed up and even though he’s been out there for half a minute, nodding and vibing, the Edge yells, “LADIES AND GENTLEMEN, MR. BRUCE SPRINGSTEEN,” as he walks to the front of the stage, mic in hand, and the crowd cheers and Bruce roars those opening lines, absolutely roars. He is singing, he is soul shouting, he is absolutely motherfucking BRINGING IT. Not that he had any choice, you know? It’s “Streets.” It’s the song where God walks through the room, according to Bono. “It’s the point where craft ends and spirit begins,” he says, and if you don’t like Bono you will find that statement pretentious, but if you have ever stood in a stadium or an arena when this song is played and every single person is on their feet and jumping up and down, you will just nod your head because you know that he is right. And Mr. Bruce Springsteen is standing in the Crossroads of the World, substituting for one of the world’s most infamous frontmen–there was no way he was going to do anything less than give it everything. “Streets” is being in the middle of a pogoing mass, “Streets” is abandon and freedom and heart, your heart opening up wider than you ever thought it could. “Streets” is knowing those moments when the song changes pace, that section at the end of the first chorus, where the band stutter steps just a second before the last verse, where the rhythm section pivots in razor sharp lock step and Larry executes those almost martial rolls into a more syncopated beat, while Edge is peeling off a wall of shimmering guitar notes that seem to be intertwining with the raindrops, echoing off the skyscrapers, bringing the world’s revolution to a halt for a split second. And all of this is happening in the middle of Times Square, with the light and the energy and the surge of the city underneath my feet, and my guy is up there singing one of the biggest songs that you can sing onstage with anyone, ever. I turned my face up into the raindrops and let them fall like liquid sunshine, and not like the freezing cold drops of slush that they actually were. It was huge and big and bright and beautiful and felt like you were standing in the middle of a lit firecracker. I have seen a lot of amazing Bruce Springsteen moments. I have seen a lot of amazing rock and roll moments. This one was absolute magic, pure and simple. As the song ends, Bruce walks to the edges of the stage, pumping his fist the way he always does when he KNOWS that he’s nailed a particular performance. He is leather jacket clad, looking thin, but that voice is full of so much energy you couldn’t possibly worry. 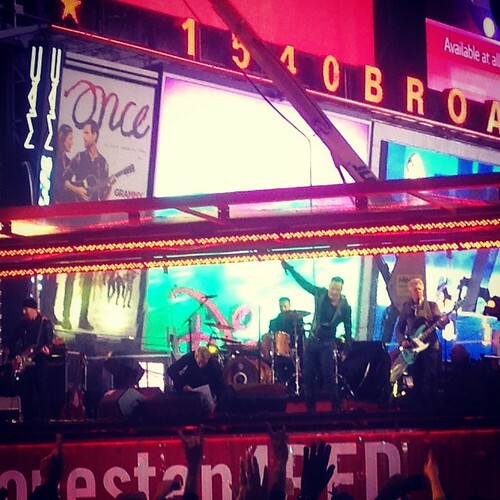 “Thank you New York…I want to send this out to Bono in Ireland,” he says, “Be well, my friend.” It’s the obvious choice for a second number, “I Still Haven’t Found What I’m Looking For,” obvious because he’s done it before (twice) and it’s U2’s version of a gospel hymn and Bruce’s heart is so very there there days. The crowd knows this one, even more than “Streets,” and they are more than ready to sing when we get to the chorus and Bruce says, “Take me to church now.” It is sweet and strong, and utterly heartwarming, the singalong echoing through the midtown canyons. We are entranced, until the musicians take off their instruments and Kanye and Carrie and Chris return, and then we remember that this enchanted carriage had to turn back into a pumpkin, and it has been both the quickest 45 minutes of your life, and also the longest. The rain has turned to sleet, and I trudge up Broadway towards the subway. I hit my train and my bus and feel like a goddamn rock and roll Audrey Hepburn, walking home an inch or two taller, vibrating with amazement and wonder. This is why we live here; this is why we put up with the rats and the crazy people on the subway and apartments the size of a kitchen for the price of a mortgage. In a split second, your day can change and you can walk uptown and into a miracle.